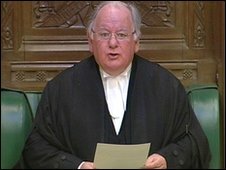 Former Speaker Michael Martin failed to "take control" and prevent police from searching the Commons office of senior Tory MP Damian Green, a report says. The Commons privilege committee found communication among parliamentary officials ahead of the November 2008 search had been "seriously inadequate". Police were given access to Mr Green's office without a search warrant. This was part of a Scotland Yard inquiry into Home Office leaks after which Mr Green faced no charges. The MP, who always denied any wrong-doing, was arrested and held by the Metropolitan Police for nine hours on 27 November 2008. His offices in Kent and in the Houses of Parliament and his home were also searched. In its report, the committee criticised Metropolitan Police for their "failure" to "expressly advise" a Commons official, Serjeant-at-Arms Jill Pay, that she could refuse them access without a warrant. Ms Pay granted officers entry after discussions with Mr Martin and Clerk of the House Malcolm Jack. There was "no excuse not to observe proper procedure", the report said. It added that a "seriously inadequate communication" between Mr Martin, Ms Pay and Mr Jack had resulted in "complete misunderstanding about the proper process for allowing a search of a Member's office". It said: "While the House and its Speaker could and should no doubt have been better served by their officials, the Speaker himself should have been asking the right questions and he should have taken more responsibility for exercising the authority of his high office." The committee also said: "Mr Speaker Martin failed to exercise the ultimate responsibility, which was his alone, to take control and not merely to be kept informed." It said the arrest of Mr Green - the shadow immigration minister and MP for Ashford in Kent - had been "disproportionate". The Home Office was criticised for allowing an "exaggerated impression" of the damage caused by the leaks, which were by an official at the department to Mr Green. The Cabinet Office - which oversees the running of government - had acted in an "ill-judged" way by giving police the idea that national security could be affected by the leaks, it added. The report said this was "hyperbolic and unhelpful". In April last year, it was announced Mr Green - who denied any wrong-doing throughout - would not face any charges. The report said the Metropolitan Police had failed to show "sufficient rigour" and the conclusion not to prosecute "could have been reached six months earlier". Home Office worker Christopher Galley, who passed on the information to Mr Green, was also not prosecuted but lost his job. The leaks, passed on to the press, involved a number of subjects including immigration and crime figures. The committee, led by former Liberal Democrat leader Sir Menzies Campbell, said the "impact of leaks on the conduct of government business is not, and can never be, a sufficiently weighty reason in itself to justify a police investigation". However, it praised Mr Martin's decision, in December 2008, to ensure that any future police search on parliamentary property could only be carried out with a search warrant from a judge. Mr Martin - now Lord Martin of Springburn - stood down as Speaker last year following criticism of his handling of the issue of MPs' expenses.